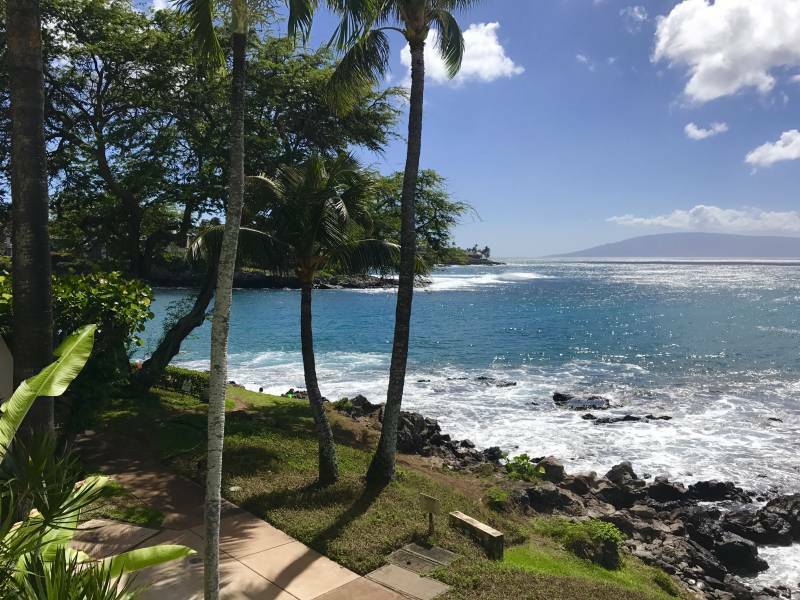 Napili Point Resort is located on Kaelekii Point (which everyone calls Napili Point) and all of the 115 ocean-view condominiums are vacation rentable. Napili Point was built in 1977, and the location and views are truly spectacular. 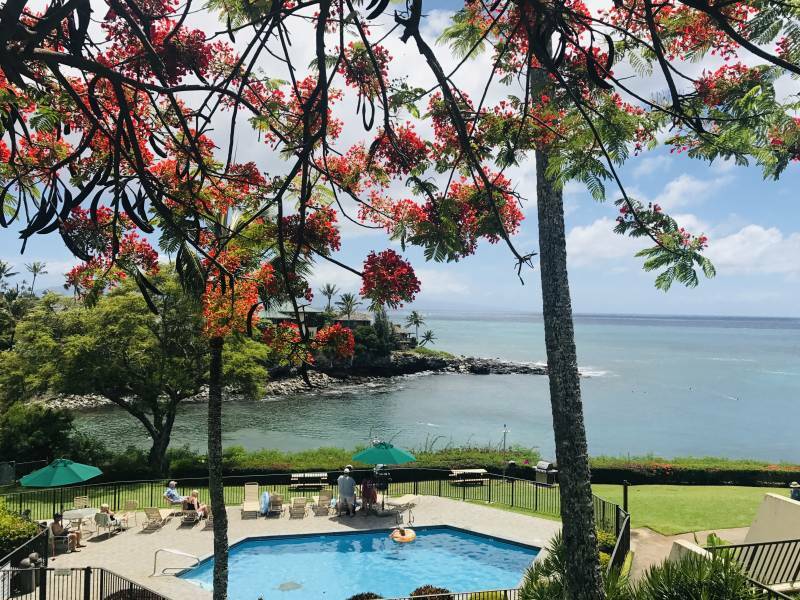 The two pools and barbeque areas are popular at Napili Point, but the main attraction is the fantastic snorkeling right out front — turtle sightings guaranteed! I like to do laps across the bay for exercise; it’s about 100 yards across, the size of an Olympic Swimming pool. You will see on my site map the three buildings farthest out on the point are leasehold (Phase I) while the two buildings nearest the office are Fee Simple (Phase II). The lowest numbered condos, 1 through 5 or so, are facing directly west with unobstructed views of Molokai with its ever-changing cloudscapes. The numbers gradually get higher as the condos wrap around the bay. The A condos are on the first level closest to the ocean and are all one-bedroom. The B level condos are the middle row, all ground floor, 2 bedrooms. And the top floor condos are the C level with a loft, also 2-bedrooms. A short walk north around the point to the Gazebo restaurant then you arrive on sandy Napili Bay beach. 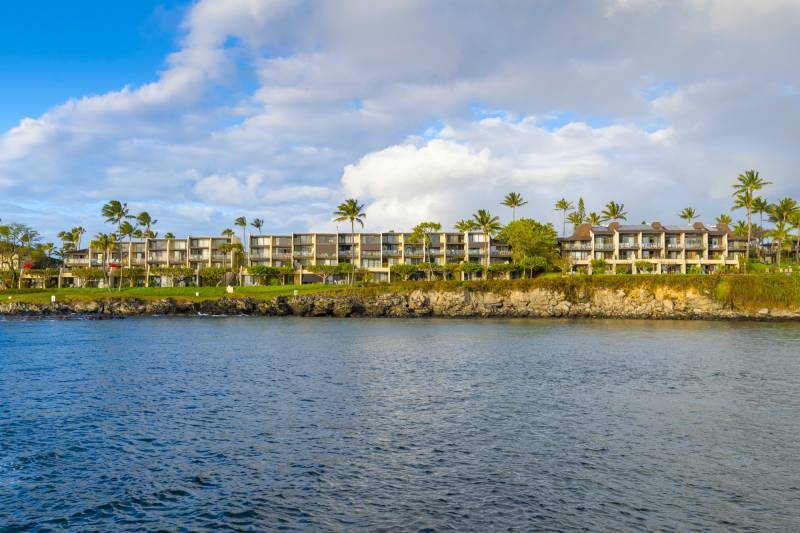 Napili borders the Kapalua Resort with world-class golf, tennis, 5-star hotels, spas and fine dining. Not to mention Honolua Bay, a 10-minute drive up North. There are currently 3 properties for sale in Napili Point. The condos that are leasehold have a low monthly lease —under $10! — and the lease is up in 2049. Some people see this as an opportunity to purchase a direct oceanfront property at an attractive price. The homeowners’ association is currently negotiating to purchase the lease. 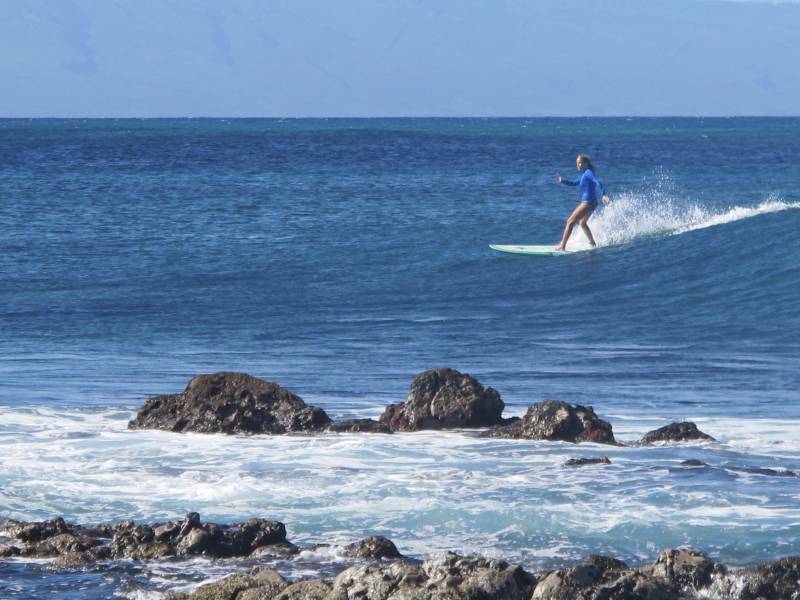 In addition to great snorkeling and swimming, there is fun surfing at Napili Point and in Napili Bay next door. Here is a photo of me surfing at “Hole-in-da-Head” right out front of the property — just don’t go out at low tide otherwise you’ll find out how the spot got its name! For more information on Napili Point or the homes across the bay where my family home is located, contact me. Napili Point is our favorite. We like to watch the snorkelers, surfers, turtles and whales. The clouds, rainbows and sunsets are over the top and the location is convenient. The gardens are beautiful with a variety of our favorite flowers. It’s nice to follow the sidewalk around the property for exercise. The view I like best is the enchanting Cottage on the point across the bay and in my dreams I am there. 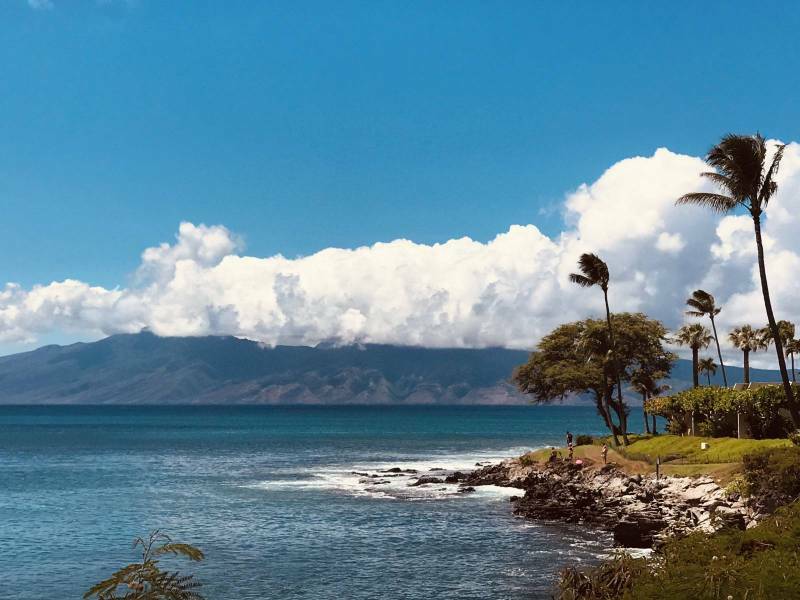 Maui is a special spot on earth, a dreamers paradise. 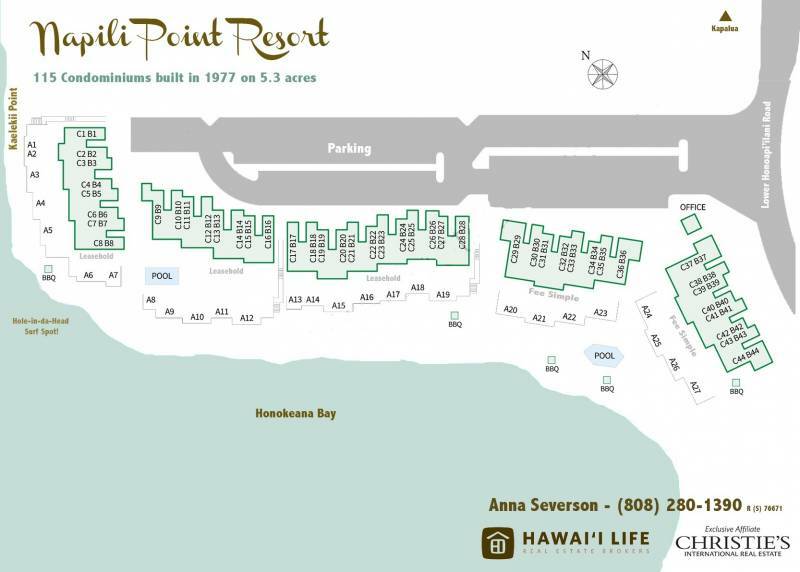 Great info on Napili Point resort. Amazing place to go on vacation. > Mahalo for the input, Mike!